Eager to plant their roots more deeply into their new hometown, experiential graphics designer Youn Choi and award-winning architect Doug Pierson, AIA, partners in life and founding partners of pod architecture + design (pod a+d) in Carrboro, have designed a modern house for their family of four that they’re about to build on a site that poses a host of challenges. Yet Pierson and Choi didn’t see those issues as limiting. They saw them as inspirational. From their design studio in the historic train depot in downtown Carrboro, Pierson explained how the land informed the custom design of the future 2500-square-foot, three-bedroom, three-bath modern house that he and Choi will share with their two young children. Pierson, whose family hails from North Carolina, and Choi, a native of South Korea, are excited about reusing the Southern yellow pine trees that have to be felled to make room for the house. They’re having all of them milled locally then returned to the site to be repurposed as cabinetry and architectural woodwork. According to the design, this modern, sustainable house will be a composition of sleek, rectilinear forms, at once soaring and grounded. Huge expanses of glass will frame views of the meadow, forest, and creek and allow natural light to fill the interior. The foundation and retaining walls will be polished concrete block. A terrace on the upper level will have glass overlook guardrails. They haven’t decided on the exterior material yet. If the past is precedent, it will be corrugated metal. But Choi is still searching for a new cladding material that can be continuously wrapped around the house’s form and respond to the site and the climate. Inside, their modern house will feature exposed structural steel, polished concrete floors over radiant heating, quartz countertops, and the repurposed southern yellow pine for custom cabinetry. Pierson pointed out that he and Choi have hired green home builder Kevin Murphy of Newphire Building in Chapel Hill, and an all-local roster of consultants and suppliers including: structural engineer Rob Munach of Excel Engineering in Carrboro; Fitch Lumber & Hardware in Carrboro; Stonehenge Masonry and Adams/Oldcastle Products, both in Youngsville; Metal Sales Manufacturing Corp. in Mocksville; and radiant flooring expert Mike Torville of Carrboro. The Choi-Pierson house should be completed by August of 2019. For more information on pod a+d, go to www.podand.com and visit the blog, pod news & media. The firm is also on Facebook, Pinterest, and LinkedIn. At pod a+d, we believe in the integration of architecture and all aspects of design to connect buildings + environment + identity. That’s why pod a+d is a hybrid firm, offering all architectural services, environmental design, experiential graphics, and wayfinding design. Exterior and interior architecture; furnishings and finishes; financial feasibility and scheduling; engineering and construction; and environmental graphics – considered simultaneously, these disciplines inform our hybrid/integrated approach to architecture. For more information: www.podand.com. The pod a+d team: L-R Wendy Broome, Youn Choi, Barbara Ngaboyamahina, Dougald Fountain, and Doug Pierson Not pictured: interns from Doug’s third-year design studio at the NCSU College of Design, Dept. of Architecture — Casey Calhoun and Nailah Watts-Harper. For the first time since moving back to North Carolina from the West Coast, Youn Choi and Doug Pierson, founders and principals of pod architecture + design (pod a+d) in Carrboro, will host Thirst4Architecture (T4A) to celebrate modern architecture and the people in the Triangle who love it on Thursday, August 16, from 6-8 p.m.
Free and open to the public, the event is one of the monthly happy hour networking social occasions established by North Carolina Modernist Houses and will be held in the firm’s studio in the historic train depot in the heart of downtown Carrboro. T4A is an opportunity for anyone interested in and associated with modern architecture to mix, mingle, and build relationships with other modern design enthusiasts in a relaxed, casual environment. Pierson and Choi will provide the location, food, and beverages while participants get an up-close look at pod a+d’s work through models and drawings. Award-winning architect Doug Pierson, AIA, recently attended the grand opening of one of his firm’s most ambitious projects to date: Rabbit Hole Distillery, a state-of-the-art, 55,000-square-foot, $15 million bourbon distillery and campus in downtown Louisville, Kentucky. For their T4A event, Pierson and Choi are having Rabbit Hole’s award-winning bourbon shipped to Carrboro. The bar staff provided by Drew Moore, owner of CrossTies Barbeque (201-East Main Street) and several other local establishments, will serve special bourbon-based cocktails as well as “straight” and “on the rocks” options, and soft drinks for pod a+d’s August 16 event. Moore is also providing CrossTie’s popular “Brisket Slides” for the evening’s savory selection. Pierson and Choi, partners in life as well as work, are relative newcomers to the Triangle architecture and design community, having recently returned from living and working on the West Coast. Their new modern house in Carrboro, which they designed together for their family of four, is under construction and will plant their roots here even deeper. “We’re so happy to be back,” Pierson said, “that we’re doing everything we can to be as ‘local’ as possible. That’s why we chose space in the old depot for our offices. We’re active in the community, we shop at the Farmers Market and Weaver Street, and we’re working with one of the best high-performance, or ‘green,’ homebuilders for our new house: Kevin Murphy of Newphire Building in Chapel Hill. We’re also hiring all-local subcontractors and vendors, including the lumber supplier.” He smiled. “And we’re always free to talk when people walk in and tell us that our space doesn’t look like a barbeque joint.” He explained that people often mistake the firm’s front door for the entrance to Cross Ties. pod architecture + design is located at 201-A East Main Street, Carrboro, NC (919.246.6466) For more information, visit www.podand.com. pod a + d is also available on Facebook. December 5, 2017 (Carrboro, NC) – Architect Doug Pierson, AIA, LEED AP, BD+ (left), and environmental graphics designer Youn Choi (below left) — partners in life and in pod architecture + design (pod a+d) — have joined the flurry of businesses relocating to North Carolina’s Triangle region. They’ve moved their architectural firm from Los Angeles to Carrboro, where they’re currently settling into new offices in The Station, the town’s 1882 train depot. Pierson and Choi relocated to the Triangle because they were ready for a lifestyle change and looking for excellent schools for their two children, Pierson said. They’d also visited the region many times since Pierson’s parents live here. With experience in all building types, pod a+d is a hybrid firm, actually. Pierson, an award-winning architect, worked in Frank Gehry’s Los Angeles office before co-founding his previous firm — form, environment, research (fer) studio L.L.P. — in Inglewood, CA. He leads pod a+d’s architectural studio. A native of South Korea, Youn Choi studied environmental design and architecture at UCLA. She worked with Disney Imagineering and Selbert Perkins Design, an international graphics design firm, before co-founding pod a+d, where she directs signage and wayfinding, interior design, and experiential graphics (the orchestration of typography, color, imagery, form, technology and, content to create “environments that communicate”). Licensed in five states and staffed with team members who bring LEED AP and BD+C credentials to the table, pod a+d provides all architectural services from concept design through construction administration. Their work has been featured in numerous newspaper, journals, and magazines. The firm’s address at The Station is 201-A East Main Street, Carrboro, NC 27510. For more information, visit www.podand.com. pod a+d offers all architectural design services that connect building, environment, and identity because we believe in the integration of architecture and design disciplines throughout our projects. Exteriors, interiors, engineering, furnishings and finishes, equipment, financial feasibility, scheduling, construction, and the environmental context – these are the contributing elements that inform our integrated approach to each architectural project’s design. More information: www.podand.com. 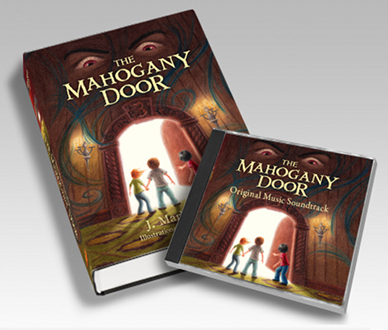 The Mahogany Door Project created the all-original music for the book's soundtrack CD. who created the original soundtrack CD for the new fantasy-adventure book “The Mahogany Door” by Durham author J. Mark Boliek, will perform live at the legendary Cat’s Cradle on Sunday, September 25, during the Carrboro Music Festival. The band’s set will begin at 4:30 p.m. The Mahogany Door Project’s live performances are laced with an eclectic style of music ranging from pop and rock to country and classical – from a mysterious and lonely rock anthem to heart-breaking country tunes, R&B acoustic compositions, and a powerful rock lullaby. And all of the songs are appropriate for all ages. The members of the band are: Mark Boliek, guitar; Jill Boliek, vocals; Scott Jackson, lead guitar; Jon Murray, guitar and vocals; Evans Nicholson, drums; Jim Gilliam, bass; Mary Summerlin, keyboard and vocals; and Chris Summerin, guitar. The band recently performed at Broad Street Café in Durham to a full house. To hear a preview of the songs, go to www.jmarkboliek.com/the-music. The CD can also be heard through a variety of online sources including iTunes, Napster, Amazon MP3. For more information on “The Mahogany Door,” a fantasy-adventure book for young readers, visit www.jmarkboliek.com. Since its inception in 1998, the Carrboro Music Festival has drawn musicians and music lovers from all over the state. Performances take on 25 stages from one end of Carrboro to the other and the all-day event is free. The complete schedule can be downloaded at www.carrboro.com/carrboromusicfestival/. Cat’s Cradle is located at 300 East Main Street in Carrboro, NC 27510 (919-967-9053). For more information and directions, go to www.catscradle.com. Musical Style/Genre: Pop, Rock, R&B, Country, Folk.